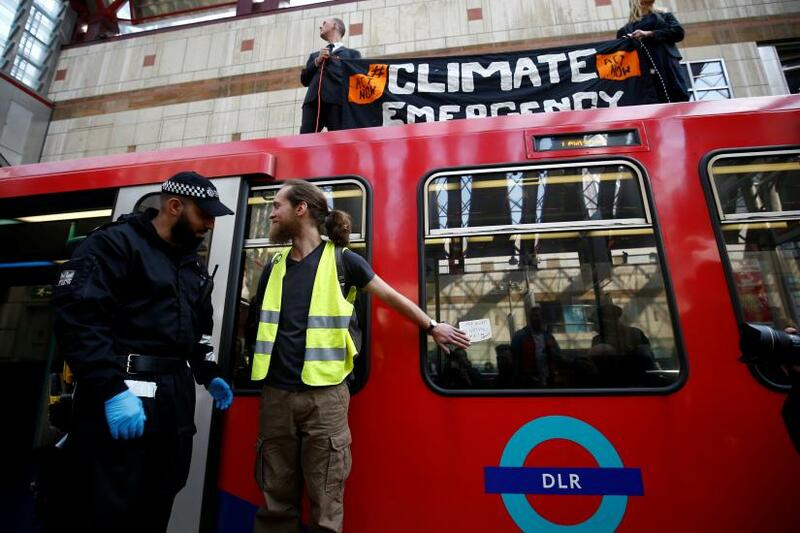 A man dressed in a dark suit and a woman wearing a black jacket stood on the roof of a train at the Docklands Light Railway (DLR) station in Canary Wharf, holding a banner which read: "Climate Emergency. Act Now." Transport for London said there were minor delays on a branch of DLR services "due to a customer incident" at Canary Wharf. British Transport Police said they had arrested one man on suspicion of obstructing the railway. London Mayor Sadiq Khan had urged protesters to avoid targeting the city's public transit system. The protests have cost over 12 million pounds ($16 million)to businesses in London's West End, famous for its theatres and shops, with some seeing a 25 percent drop in sales and footfall. "This additional pressure is deeply damaging to London’s economy and reputation," said Jace Tyrrell, chief executive of the New West End Company, which represents businesses in the area. "We need to ensure we are striking the right balance between allowing the right to a peaceful protest, while ensuring disruption to communities is kept to a minimum," Chief Superintendent Colin Wingrove said on Tuesday.